Do the Vatican’s secret archives contain evidence of a medieval cover-up concerning the final days of the mother of Jesus Christ? This is the quest to solve one of the greatest unsolved mysteries in Church history: the true location of the tomb of the Virgin Mary. 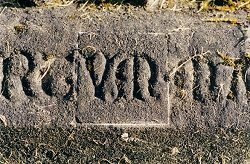 An enigmatic inscription VM. One of the mysterious trail of clues leading to the secret location of Mary’s grave. 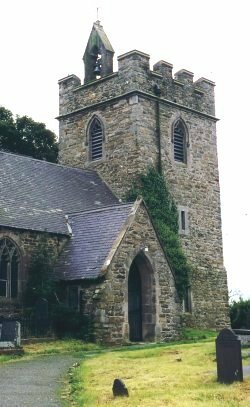 The church of St Mary in the village of Llanerchymedd, Wales. A letter written by St Augustine to the Pope in 597 suggests that this was where Mary was buried. 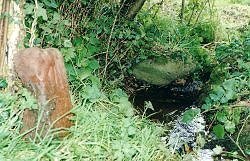 A solitary stone beside a holy spring at Llanerchymedd. Does this mark the grave of the Virgin Mary? Click to order hardback edition. What became of the Virgin Mary after the Crucifixion is one of the greatest mysteries of the Bible. The New Testament tells us almost nothing: not where she lived, nor where or how she died. 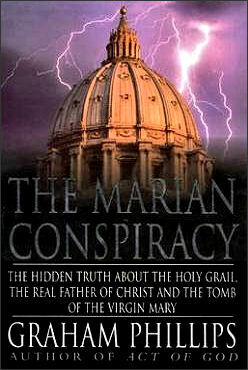 The Marian Conspiracy is Graham’s personal quest to solve this fascinating enigma. Marian devotion - the veneration of the Virgin Mary - became a central theme of Church theology from early Christian times. Although it appears nowhere in the Bible, the tradition of the Assumption - Mary’s bodily ascension into heaven - was accepted by many Christians as historical fact. However, some Christians continued to believe that Mary had died naturally and had been buried in a tomb in Jerusalem’s valley of Jehosaphat (see here), while others said that her final resting place was in the Roman ruins of Ephesus in Turkey (see here). For centuries the issue of Mary’s tomb continued to divide theologians. Following the turmoil of World War II, the Vatican instigated a project to investigate the authenticity of the two rival tombs. Although no historical evidence was found to verify the case for either of these two sites, the Vatican archaeologist Giovanni Benedetti claimed to have found persuasive evidence for a third and completely forgotten tomb. In 1950 he was about to publish his findings when Pope Pius XII declared, for the first time, that belief in the Assumption was dogma - official Church teaching. As all Roman Catholics were now required to accept Mary’s bodily ascension into heaven, it followed that there could be no tomb of the Virgin Mary anywhere in the world. Benedetti was summoned to the Vatican and told to keep quiet about what he had discovered. He reluctantly agreed and remained silent on the issue for the rest of his life. Not only was the archaeologist a devout Catholic and feared the threat of excommunication; the instructions had come directly from what is now the Congregation for the Doctrine of the Faith - the powerful Vatican department that was once known as the Inquisition. In a quest to rediscover the mysterious tomb found by Giovanni Benedetti, Graham Phillips followed a trail of historical clues that took him from the Vatican to Jerusalem and from Turkey to the British Isles. During this search Graham uncovered intriguing evidence of what really happened to the Virgin Mary after the crucifixion of her son. A story that had been suppressed by the established Church for centuries. According to a fourth-century manuscript still in the Vatican, during the persecutions of the first Christians, Mary had been smuggled out of Palestine to the safety of a Christian community founded outside the influence of the Roman Empire in the far-off island of Britain. In AD 597, St Augustine, the first Archbishop of Canterbury, discovered evidence of Mary’s tomb on an island off the west coast of Britain and promptly informed Rome. As a proponent of the Assumption, the reigning pope, Gregory the Great, immediately instigated a conspiracy of silence that was to last for 1400 years. In The Marian Conspiracy, Graham Phillips unravels the truth behind this centuries-old ecclesiastical cover-up and discovers what may be the final resting place of the Virgin Mary - beside a holy spring at Llanerchymedd on the Welsh island of Anglesey. "The historian Graham Phillips believes, after years of investigation, that Mary’s burial site is the church of St Mary the Virgin in Llanerchymedd"
"Graham Phillips is a seeker of the truth"
Translations: Newton and Compton (Italian), Amber (Polish), Sankosha (Japanese), Clássica Editora (Portuguese), Editorial Planeta (Spanish), AST Publishers (Russian), Livani Publishing Organization (Greek), Remedium Publishing (Slovak). 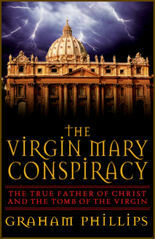 US Edition: The US edition of The Marian Conspiracy is published by Bear & Company under the title The Virgin Mary Conspiracy. UK and Commonwealth editions: HB Sidgwick & Jackson 2000, PB Pan 2001. Click on image to order the US edition.